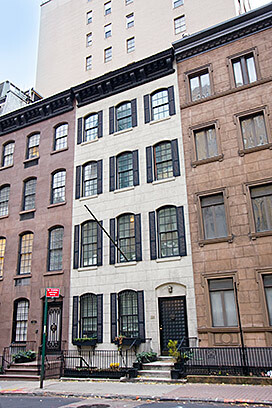 An article about this unique townhouse appeared in The New York Times. Located on an elegant Murray Hill Historic District block, this 20’ wide, box-shaped single family home has a rare architectural footprint. The exterior is Second Empire style with an English basement and a stucco façade. Its square jewel box layout is both inviting and unpretentious. Original details, wall and ceiling ornaments, and working fireplaces decorate almost every room. Recent renovations include a new kitchen with state-of-the-art appliances, refinished floors and woodwork, complete repainting, new windows, and remodeled bathrooms. In 1869, Murray Hill became so coveted that the developer Abraham B. Embury chose to build five 24’ deep townhouses instead of one townhouse on a 100 foot lot. The result is a great buy today: a fully renovated, finished single family home at a price affordable for the typical apartment buyer. Its 2400 square foot floor plan and 400 square foot roof deck provide the ideal living space for either a single person or a family. Are you interested in buying this Manhattan Townhouse? For more information on NY townhouses and New York City Brownstones for sale , contact Vandenberg — The Townhouse Experts TM. We specialize intownhouse realty.